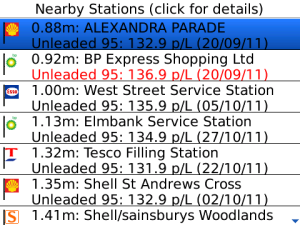 Whatgas petrol pricing information is now available on your Blackberry, using an app developed by ExtraUrban. Use Fuel UK to quickly find the nearest petrol station, as well as the available fuels and prices courtesy of the whatgas.com community database. With prices varying by up to 10p a litre within just a few miles, this app can really help you save money. 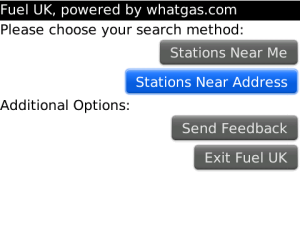 Fuel UK also allows you to search for stations at an address or postcode, and view their location in BB Maps. Join the thousands of other contributors to the whatgas database and help other road users save money by submitting the prices of any stations you know about. Supports all fuel types including LPG. Brands are clearly labelled (e.g. Shell, Tesco, Total, BP, Esso, Sainsburys etc.) so that you can easly find the stations for your loyalty card or preferred performance fuel. For more details on this Blackberry application take a look at the platform Blackberry App Store.